Love data, reports, and rankings? Click here to scroll through our archive of all things data-driven. Photo by Brian Addison. 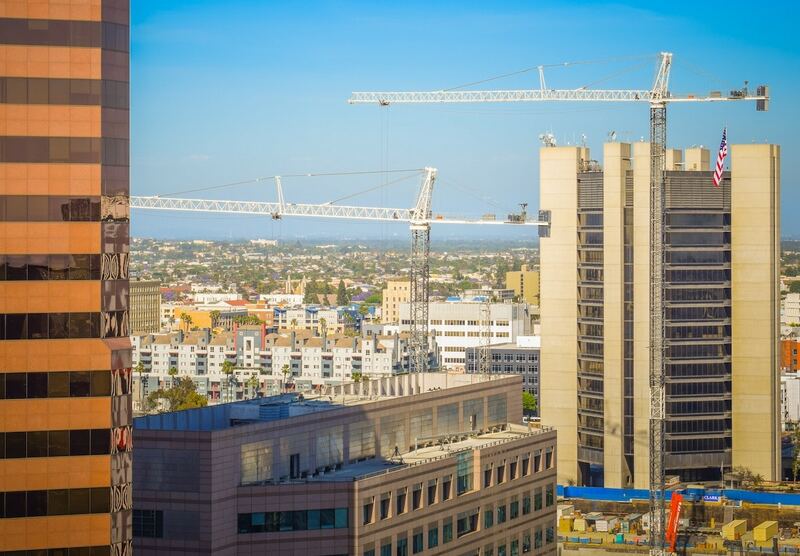 Above: cranes loom over DTLB as construction for the Civic Center takes place. Using six indicators as measurers—population, median income, home values, share of inhabitants holding a higher education degree, poverty rate, and unemployment rate—researcher and writer Balazs Szekely of Rent Café measured the prosperity across United States cities. Within the data, there was a particular note important to Long Beach and Los Angeles: there were only 11 cities out of the 300 analyzed that saw improvements across all measures, and Long Beach and Los Angeles were the sole Californian cities to make that honor. Specifically, each saw home value and the education level of their workforce increase heavily. However, there is a large caveat: middle-class and low-income workers aren’t seeing the prosperity returned to their own sense of living. “While Los Angeles and Long Beach proudly represent the Golden State in this elitist short list—both cities showed significant increases in terms of home value and the education level of their workforce—there remains a huge discrepancy between wage growth and home value change,” said Adrian Rosenburg of Rent Café. That discrepancy was nothing to ignore. Between the two cities, for example, there was a 0% wage change between 2000 and 2016 but each saw home value skyrocket. 61% increase in Long Beach’s average home value and 64% in Los Angeles with only a 2% and 6% change in population. The result? Despite advances in decreasing poverty and unemployment, the middle class and low-income households of the region aren’t benefitting from the increase in prosperity. Examining California’s sole Top 10 entry, the City of Fontana, is both fascinating and enlightening. Originally a rural town in the Inland Empire before the steel industry moved in, Fontana saw a massive increase in its population between 2000 and 2016—60% to be exact. With that, its increase in home value matched: 60%. On top of that, it has 57% increase amongst its population’s education.